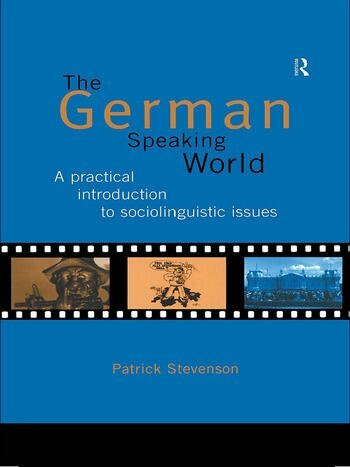 This accessible textbook offers students the opportunity to explore for themselves a wide range of sociolinguistic issues relating to the German language and its role in societies around the world. It is written for undergraduate students who have a sound practical knowledge of German but who have little or no knowledge of linguistics or sociolinguistics. It combines text with practical exercises and discussion questions to stimulate readers to think for themselves and to tackle specific problems. In Part One Patrick Stevenson invites readers to investigate and reflect on issues about the status and function of the German language in relation to its speakers and to speakers of other languages with which it comes into contact. In Part Two the focus shifts to the forms and functions of individual features of the language. This involves, for example, identifying features of regional speech forms, analysing similarities and differences between written and spoken German, or looking at the 'social meaning' underlying different forms of address. Part Three explores the relationship between the German language and the nature of 'Germanness'. It concentrates on people's attitudes towards the language, the ways in which it is changing, and their views on what it represents for them. Acknowledgements. Introduction. How to Use This Book. Part 1. 1. German: Language, People, Place. 2. German in Contact With Other Languages. 3. German as an International Language Part 2. Exploring Linguistic Variation. 4. Regional Variation in Spoken German. 5. Written German, Spoken German. 6. Public Language. 7. Communicative Conventions and Social Relations. 8. Language and Gender. 9. Multicultural Society and Intercultural Encounters. 10. Sprachkultur: Preserving the Cultural Heritage. 11. Sprachkritik: Public Attitudes Towards Language Use. 12. Sprachwende: Language Change as Social Change. Index of Terms. Bibliography.